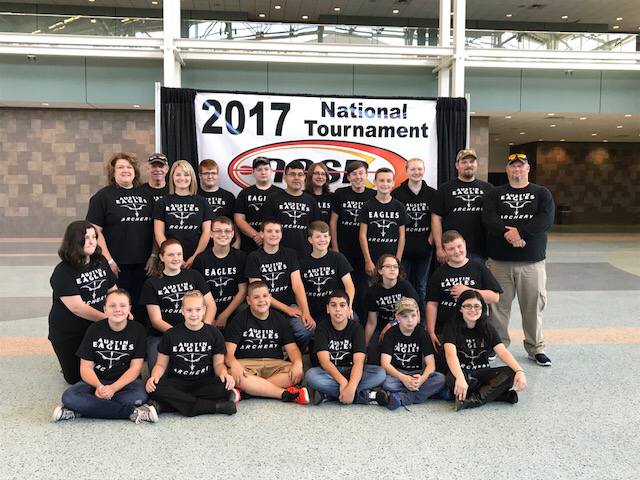 The Austin Middle School Archery Team competed in the National Archery in the Schools' National Championship on May 13 in Louisville, KY. This event hosted approximately 18,000 of the best shooters in the national. Austin's team of 21 shooters finished the tournament with a team score of 3,198 and placed 95th out of the best 242 teams in the nation. The AMS team also finished 8th in the State Tournament in March. Austin Middle School's archery program has had a very successful season for only its second year in existence. The middle school team is coached by Tammy Rice and Cliff Rice, owners of High Performance Archery. Austin High School's archery team also recently completed its first year. The team had a successful year competing in tournaments at Scottsburg High School, Southwestern and a state qualifier event. The high school team is coached by Larry Morgan and Justin Wooten. Both teams are looking forward to improving their records next year. All students that will be in grades 6-12 next year are invited to try-out for the high school and middle school teams sometime at the beginning of next school year. There are also plans to include an elementary team next school year, which would be open to 4th and 5th grade Austin Elementary students.